Vape Expo Poland 2016 was the first event of this type in Poland taking place on the grounds of Warsaw Expo in Nadarzyn on 4th and 5th March 2016. With over 100 brands from all over the world, including countries as exotic for Polish people as Malaysia or China it was definitely a place to be for manufacturers, wholesalers, consumers and vaping magazines not only from Poland. Chemnovatic at Vape Expo 2016! The first Vape Expo held in Poland will take place on the 4th and 5th March 2016. Friday is devoted to a conference with over 10 topics covered and some well known faces of the industry as speakers. Some of the topics are focusing on the recent TPD regulations, for example “Regulatory Practicalities of Implementing TPD” or “TPD regulation” but also more general topics on e-smoking business and related issues. Day 2 includes events aimed more towards vapers and general public, such as Miss Vapor, Cloud Contest and E-liquid awards. There is also a display part open to all visitors from 10:00 until 18:00 both Friday and Saturday, where manufacturers can meet their prospective customers and business partners, vapers can try new products, share experiences, discuss and network. 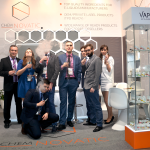 Chemnovatic team will also be attending the Vape Expo 2016. We are looking forward to meeting some of our customers and hopefully start some new, exciting cooperative projects. Come, say hi, grab a coffee – visit our booth #E2.